germinates and listens for the world’s pay. like corn till blood waters the soil. Worms wade in the reddened wet earth. A sudden shadow. A swallow swoops. from spring to summer long. from tolerance, add to outrage. churns to a vengeful melting pot. strings, a choir outcries, a fat lady sings. 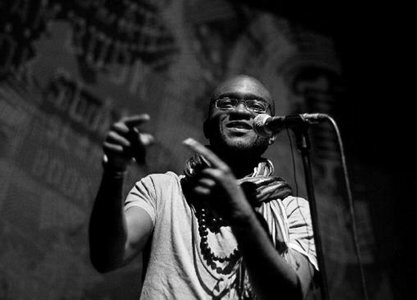 Born in Jos, Plateau State, Nigeria ‘1984, Inua Ellams is a Word and Graphic Artist, a writer with a style as influenced by Classic literature as it is by hip hop, by Keats as it is by MosDef. Rooted in a love for rhythm and language, he crosses 18th century romanticism & traditional story telling with contemporary diction, loose rhythm and rhyme. However, his first love was visual art; the first time he toyed with a pencil, he fell for the magic of line and form. He works extensively as a graphic designer / visual artist and also tries to mix the old with the new juxtaposing texture and pigment with flat shades of color and digitally created designs. He works in online and print.